Note that apple green tip should occur app. 101 DD (Base 43), although obviously there is a range. We are not officially (IMHO) at green tip on McIntosh yet in Belchertown, although I suspect we will be by the end of the week (if the weather forecast holds). • This may not be your last Healthy Fruit (HF), however, please go to the UMass Extension Bookstore (http://umassextensionbookstore.com) and purchase a new 2016 subscription to HF ($50, e-mail delivery only) in the next week or two. Alternately, you can send me (Jon Clements, 393 Sabin St., Belchertown, MA 01007) a check for $50 made out to 'University of Massachusetts.' Make sure you note it is for Healthy Fruit subscription, and includes your e-mail address. You can also use this mail-in form to order Healthy Fruit and other UMass fruit publications. • Sometimes I run into some confusion regarding our UMass fruit program publications and membership in Massachusetts Fruit Growers' Association (MFGA). MFGA membership is $200 ($25 for non-grower members) and includes a complimentary subscription to American Fruit Grower. It does not include any UMass fruit program publications. You can join or renew your MFGA membership using a credit card here. 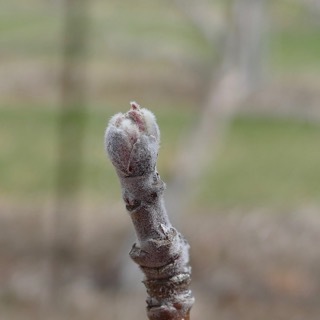 (You can also make a voluntary donation to the UMass Cold Spring Orchard Research & Education Center, UMass Apple IPM Program, and/or MFGA's Horticultural Research Fund.) You can also join or renew MFGA using a mail-in form here. Note that using the mail-in form you can also order UMass fruit publications, but I don't recommend ordering UMass fruit publications with your MFGA membership using that form. If you want to order UMass fruit publications, I recommend you use this mail-in form. (Or you can order and pay using a credit card at the UMass Extension Bookstore.) I hope that clears things up a bit. I encourage you to both join MFGA and order the UMass fruit publications that are of interest to you. More information on our UMass fruit publications is available here. If you have any questions, please get in touch with me. • Otherwise, the weather is arguably challenging right now. Green tip is coming on ever so slowly, and we are definitely in a cycle of ups and downs temperature-wise. 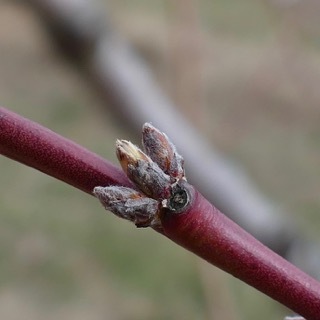 Some things to watch: scab infection period(s) when green tip arrives; critical temperatures for bud stages (polar vortex arriving next week, forecast lows in the mid-20's for Belchertown, that should not be a problem); DO NOT rush to apply oil, the oil window is open through tight cluster; copper should go on by late green tip to 1/4 inch green (although I am getting less convinced it is worth it to rush out and apply a full dose copper at that point); PLAN on treating for scale this year, however, tight cluster is the best timing for oil, Lorsban, Esteem, and/or Centaur. PLAN on treating for scale this year! Right now (weather conditions permitting) with 3% oil and excellent coverage. Alternate control timing centers around tight cluster, using oil (1.5%), Lorsban, Esteem, and/or Centaur. See article in Scaffolds Fruit Journal (March 28, 2016) for details! 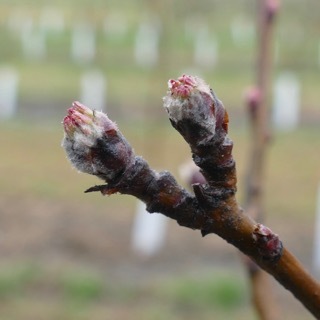 • A collaboration of tree fruit specialists in all six New England states, and with Cornell University, the 2015-2016 New England Tree Fruit Management Guide (NETFMG) is a must-have for all commercial orchardists. 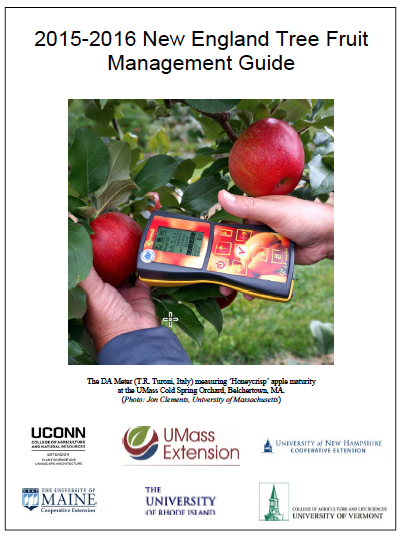 The 2015-2016 NETFMG is 283 pages and includes chapters on: Integrated Crop & Pest Management; Organic Tree Fruit Production in New England; Pesticide and Sprayer Information; Characteristics of Crop Protectants Used on Tree Fruits; Disease, Insect, Weed, Wildlife, and Nutrient Management; and specific spray management recommendations for Apples, Pears, Cherries, Peaches and Nectarines, Apricots, and Plums and Prunes. The 201-20165 NETFMG is available for purchase for $25 on the UMass Extension Bookstore, http://umassextensionbookstore.com/. (Or you can also use this mail-in form to order Healthy Fruit and other UMass fruit publications.) 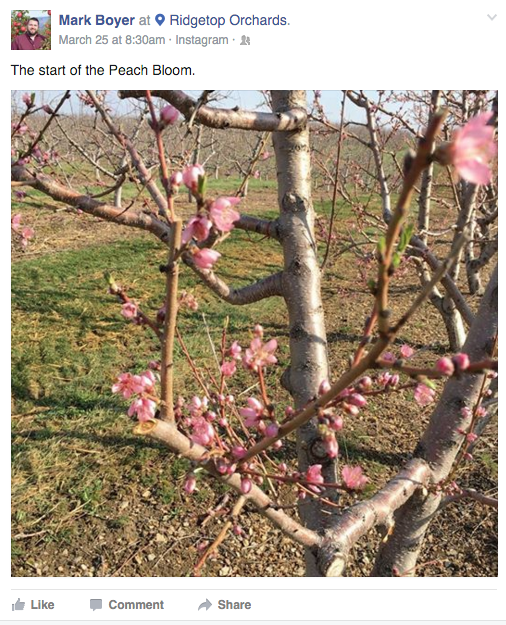 NOTE that there is no change from the 2015 New England Tree Fruit Management Guide. The 2015-2016 NETFMG will also be available for sale at Fruit Twilight Meetings. The 2015-2016 can also be downloaded (as PDF's for free, make a home screen shortcut on your mobile device!) here. AND finally, there is a 2016 Update to the NETFMG here. But there's MORE! 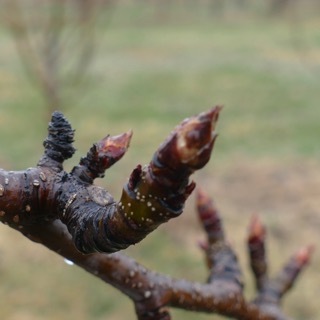 An Update to the 2015-2016 New England Tree Fruit Management Guide can be found HERE! Thanks to the hard work of Mary Concklin (UConn), Heather Faubert (URI), and Glen Koehler (UMaine). • I saw quite a bit of pear psylla issues last year as evidenced by soot mold and a generally messy situation. One control window is NOW with a good dose of OIL at 3% (until buds really swell), or at a good SWOLLEN BUD see Table below from 2015-16 NETFMG. All locations where winter moth eggs are being monitored have at least some blue eggs except eggs in Little Compton. All monitored eggs in Little Compton are still orange. Eggs turn blue about 2 days before hatching. I think it will be another week before eggs start turning blue in Little Compton. In Kingston & Warwick, RI, Pawcatuck, CT, and Franklin, MA more than half of monitored eggs have turned blue and have been hatching. In Cumberland, RI and Hanson, MA eggs are a bit behind and just started turning blue over the weekend. 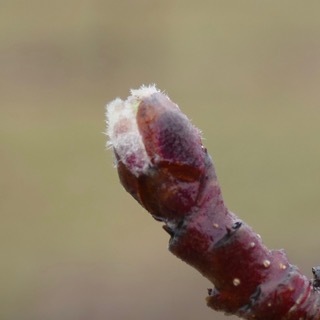 If you want to protect apples, pears or blueberries from winter moth caterpillars in any winter moth infested areas (other than Little Compton and other cool areas along the ocean) spray with an insecticide as soon as possible. I think it is best to wait to spray landscape trees until leaves emerge. Winter moth caterpillars are pretty easy to kill, provided they are not inside closed buds. 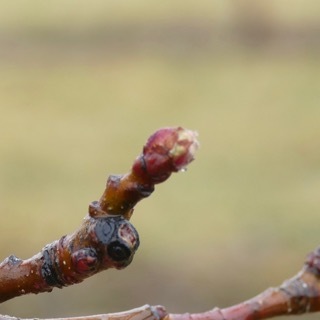 Insecticide choices for when caterpillars start to hatch for fruit growers include, but are not limited to, spinosad, Imidan, Sevin, Malathion and synthetic pyrethroids such as Asana. Spinosad products are Delegate, mostly for commercial growers, Entrust for organic growers, and Captain Jack’s Deadbug Brew is formulated for small-scale growing. Adding a dormant oil may be useful for the first spray of any of the listed insecticides. 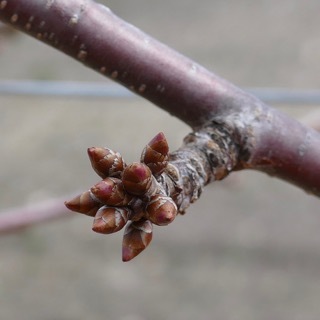 Once buds are open, B.t. kurstaki products (Bacillus thuringiensis kurstaki) such as DiPel and Biobit work well. For landscape trees, winter moth caterpillars can be controlled once trees leaf out with spinosad (Conserve), B.t. kurstaki (Dipel Pro, Javelin, and others), as well as synthetic pyrethroids such as bifenthrin. B.t. products are a good choice because they kill only caterpillars, but B.t. products break down in sunlight after 3-5 days so may need to be reapplied more frequently. 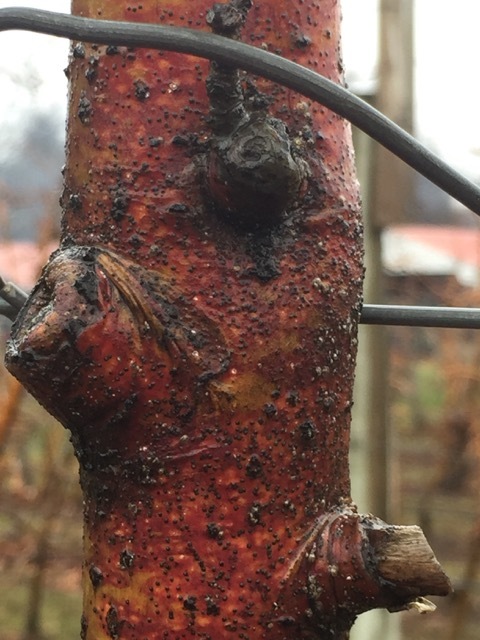 • A green tip copper spray to apple and pear is one part of a fire blight management program. A green tip copper spray (of your favorite product) at a higher rate his strongly advised. Apply to all your apple and pear blocks at green tip. Everything you always wanted to know about copper sprays HERE thanks to Kari Peter at Penn State University. Its that time of year again. Scab season is afoot and here at the UMass lab (and in the field) we are tracking ascospore, primary scab inoculum, maturity and release closely. Last fall, scab infected leaves were collected from unsprayed trees and kept outside to allow natural development of the pathogen. We use four different observational methods to evaluate ascospore progress: 1) the petri plate assay, where infected leaves are soaked in water to stimulate spore dispersal then suspended over two microscope slides for an hour and a half, 2) the funnel trap consists of a single fan that draws air over scabby leaves down through a funnel to an orifice over a microscope slide, 3) squash mounts are prepared by plucking pseudothecia from scabby leaves and squashing them on a glass slide causing the contents to spill out, 4) the two-fan field trap uses fans to draw air over a batch of infected leaves, blowing spore onto a microscope slide during a rain event. With each of these tests, the microscope slide is checked fro the presence of ascospores, and in the case of the squash mounts percent maturity is determined. Last week, while we did find 9.6% of asci within pseudothecia to contain mature ascospore in the squash mount assay, no spore were released in any of the other two lab based trapping tests. After the rain event on Friday, March 25, the microscope slide in the MacHardy two-fan trap, our field test, was inspected and no ascospores were seen. Great news! This week, as you might expect, the number of mature ascospore seen in the squash mount assay has increased to 13.7%. The two-fan trap microscope slide that was inspected after the rain event of Monday the 28 yielded no spore either. Additionally, no spores were seen in the funnel trap. More interesting, however, is what we are seeing in the lab assays that show spore being released. In the petri plate assay conducted on 3/29, a total of 4 ascospores were seen. 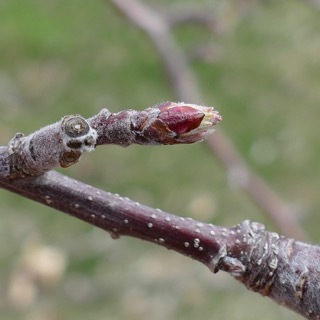 While this is interesting news, the bottom line is: if there is no susceptible green tissue in the orchard, scab season hasn’t really started… Yet. Which means there is still time to get that early season copper application on. Because the grower's list of things to do at this time of year isn't long enough. But seriously, who likes weeds? We don't like weeds: they are messy and eventually bind up mowers and other equipment. Crop trees don't like weeds, they compete for water and nutrients and root space. Clear wing moths, aka borers (dog wood borer, lilac borer, lesser peach tree borer, greater peach tree borer), love weeds. So do tarnished plant bug and dock sawfly. In addition to providing an excellent home for these insect pests, weedy orchards are also prone to increased vertebrate pests. So, while you may have a very long list of things to do to get ready for the upcoming growing season, keeping on top of weed management early can save you some headache further down the line. This will be especially important for borer management moving forward as we face the loss of lorsban for treating these pests. Ed. note: you really need to be thinking of applying a good pre-emergent herbicide right now; Chateau SW @ 6 to 12 oz. per acre (pre-bud-break, so real soon) or Alion @ 3.5 to 6.5 fl. oz. per acre (trees 3 or more years in the orchard) with Prowl H2O @ 2 to 4 qt. per acre would be a gold-standard. If emerged weeds are growing and/or greening up include a contact herbicide: glyphosate (Roundup et al), paraquat (Gramoxone), or glufosinate-ammonium (Rely). Note that Rely can now be used on ALL tree fruit. Always avoid soaking tree trunks with any contact herbicide! And there must be some bare ground for pre-emergent/residual herbicides to work properly. The next Healthy Fruit will be published on Tuesday, April 5 or thereabouts, 2016. As always feel free to get in touch with any member of the UMass Fruit Team (http://extension.umass.edu/fruitadvisor/team-members) if you have questions or comments.